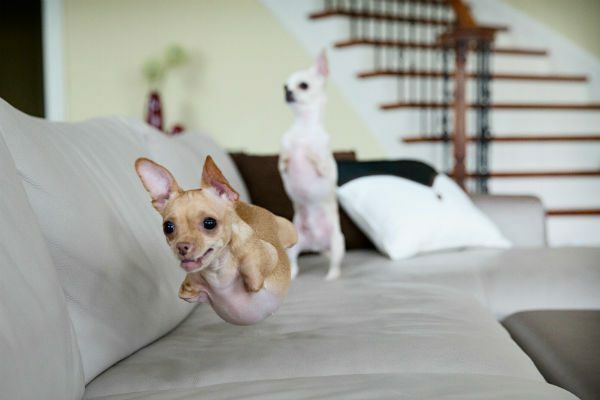 Kanga and Roo are very busy two-legged Chihuahuas. Adopted by Therese Vu and Duc Tran in 2013, these lucky littermates are now hopping, skipping, and rolling all over the place — but they didn’t always know this kind of freedom, or this kind of love. Eventually the breeder realized these two dogs born without front legs deserved a life beyond that bathroom. 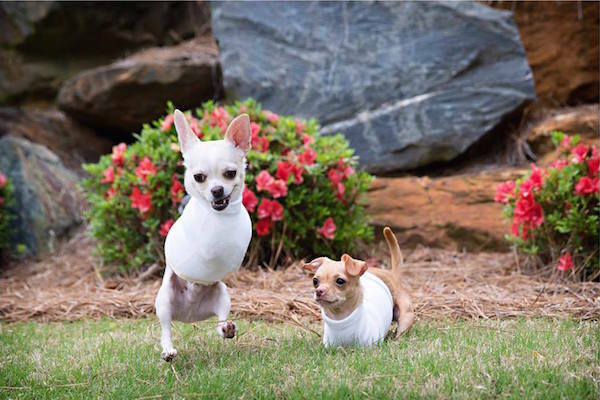 The pair were surrendered and ended up in the care of Angels Among Us Pet Rescue, a volunteer-based organization dedicated to rescuing pets from overwhelmed shelters in Atlanta, Georgia. Falling for Kanga and Roo was a relief for Vu, who was still reeling from the loss of the couple’s previous dogs — another bonded pair who had lived to be 16 and passed away within a month of each other. Once worried she would never be able to love another dog, Vu felt her fears evaporate when she held Kanga and Roo at an adoption meet and greet. On June 25, 2013, Vu and Duc brought Kanga and Roo home to the house they had lovingly prepared for the special-needs pups. The couple quickly realized that the brother and sister are definitely unique individuals. “Kanga — he’s the white one, the male, about 6 1/2 pounds — he walks completely upright,” Vu explains, adding that Kanga is more social with strangers while 5 ½-pound Roo is reserved. “She scoots on her belly more and takes a little time to warm up to you,” says Vu. Although both dogs are able to move around without assistance, Vu and Tran knew they would need the support of wheelchairs in order to protect their joints from long-term damage. 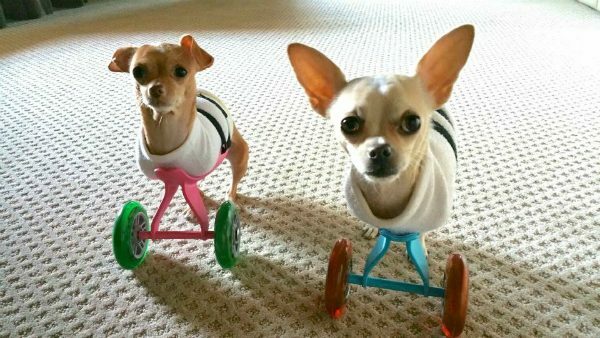 Shortly after adopting the dogs, the family travelled to Massachusetts to have them fitted for custom carts by Eddie’s Wheels. According to Tran, Kanga is really good at racing toward his lunch, and Roo is starting to get the hang of it, too. The pair also has sets of lighter wheels inspired by fellow Dogster Monday Miracle, Turbo Roo. Wheels weren’t all Kanga and Roo needed, though. Over the past year, Roo has had three surgeries on her legs to correct a condition that could have further limited her mobility. “Her legs were so bowlegged that both of her kneecaps were getting twisted to the back of her legs, and she started losing feeling in her toes,” Tran says, adding that an orthopedic veterinarian used tiny screws and a metal plate to straighten Roo’s back legs. Tran says he thinks Roo and Kanga might have a future helping humans as therapy dogs, but the pair are already helping other two-legged dogs. The white “shirts” the pair wear to protect their bellies from scraping on the ground were developed by a friend of the family who works in human prosthetics. Now, many of Kanga and Roo’s two-legged dog Facebook friends are sporting the protective garment, courtesy of Vu and Tran. The Chihuahua-loving couple shared Kanga and Roo’s story on Facebook hoping to encourage dog lovers to adopt instead of supporting unethical breeding operations. They say it’s disappointing when people suggest Kanga and Roo should be euthanized, as the siblings are two of the happiest (and most pampered) dogs on the planet. “Just because they have some sort of defect, that does not diminish the value of their lives,” Tran explains. The post Kanga and Roo Don’t Let Having Just 2 Legs Each Slow Them Down appeared first on Dogster.